Caught up in the holiday spirit, I decided to make a bunch of fruit pies over the weekend. Apple alone was too predictable, so I raided some of my precious freezer stash of fruits I’ve picked throughout the year to make some mix-and-match combinations. 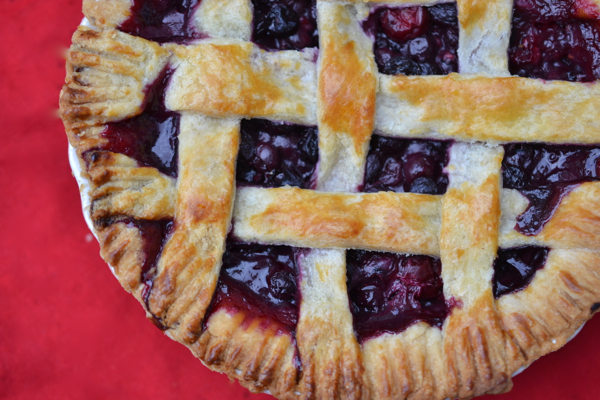 This blueberry-raspberry pie (blueberries from our trip to the Berkshires in Massachusetts, raspberries from our trip to Washington state) was the all-around favorite. Did I miss anyone? And that even begin to cover the growers, distributors, market owners, and associations I’ve worked with closely this year. All of these experiences have made me grateful for every fruit and vegetable I’m able to serve to my family, representing hours of labor, learning and love. Thank you, farmers. I love visits like these, it’s so eye opening to see a behind the scenes view of farms and food. Really brings it all to life, doesn’t it? I think I might be a little envious of your macadamias in Hawaii though…!! !